My September century will be remembered as the most memorable so far and most likely, the year. 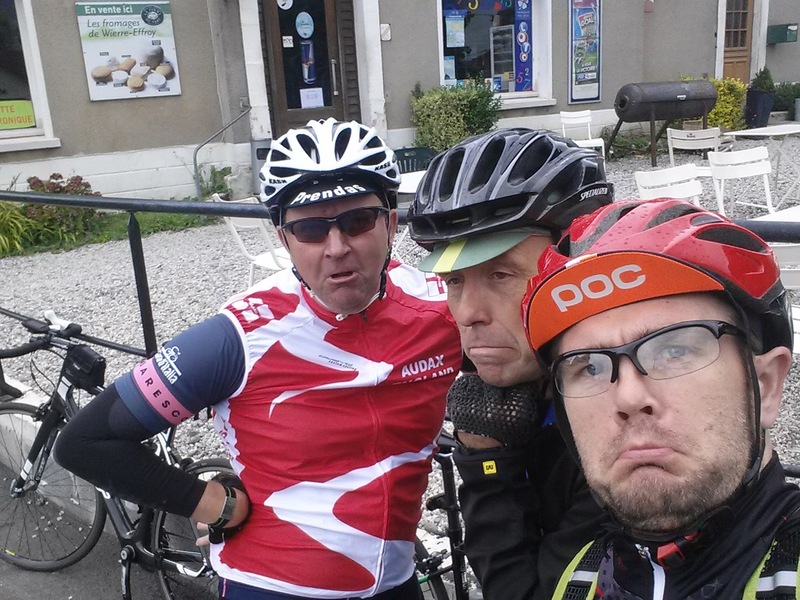 The planning for this ride started back in January when one of the members of Cycling UK on Google+ created the event for a day ride in France and asked who would be interested in taking part. My instant reaction was positive but only one snag, I didn't have a passport. However, with almost 8 months until the event, I had plenty of time. It wasn't long before I got my passport application sent off and it came back a week later. Now I could book my tickets. 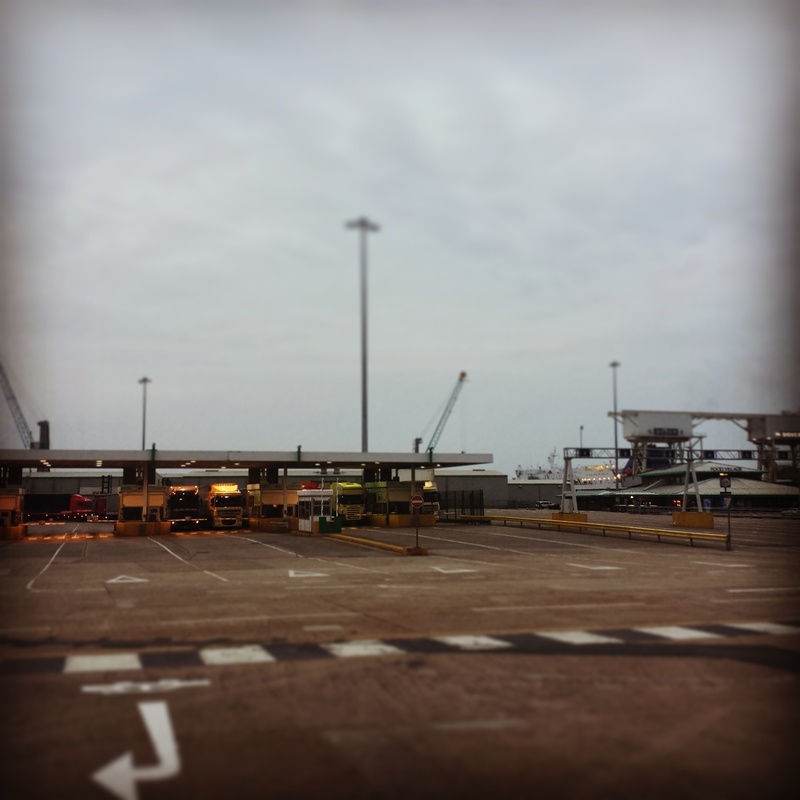 It was suggested that we book on the 07:35 outbound ferry and return on the 17:55. Although the tickets were cheap at £7.50 each way, I decided to go for the slightly more expensive fully flexible tickets for £12.38 each way. That meant if anything didn't go to plan, I could just get the next available ferry. So, before the end of March I was now ready for our French Adventure! The ride was planned as a 64 mile route, courtesy of Wiggle, from the ferry terminal in Calais with a stop for lunch around 40 miles in before heading back to the ferry. It wasn't until nearer the time that I considered making this ride my 100 mile ride for the month. After a little bit of planning, I worked out that I could drive to Dymchurch, ride the 20 miles to Dover and by the time I ride the 20 miles back to my car I would have completed my century. On the day, the weather forecast was for drizzle and rain at times. With this in mind I made sure I had my rain jacket and my waterproof socks. I got up at 03:15 and left my house at 03:46. I was surprised at how warm it was - my car was showing 17c as the outside temperature! The roads were empty as you'd expect but with so many towns and villages to go through on my way it was taking longer than expected. Once I arrived in Dymchurch, I parked up and unpacked my bike from the car. I got underway at 04:59 and it was pitch black but not yet raining. Now 18c I couldn't believe how warm it was on the bike. The route to Dover is fairly straightforward but as I needed to avoid the main A road and motorway once in Folkestone I had to check my phone a couple of times for directions. It's completely flat until you hit Folkestone. There's a sharp ramp to start with but it's not hilly again until you exit the other side. I then stumbled upon a hill I wasn't expecting, suitably entitled, Dover Hill. Once at the top, it's a very, very long and gradual descent all the way into Dover. With the wind behind me, this was bliss. 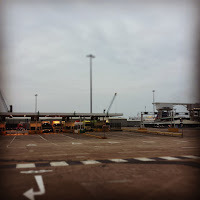 I arrived at the docks at 06:29, not bad as I only needed to be there by 07:05 at the latest. Dover docks aren't especially bike friendly but there is a red line for you to follow. This takes you to French passport control and then onto a check in desk where you get your boarding pass. I didn't have to wait long before my ride partners for the day turned up in the form of Simon (organiser) and Dave (long distance legend). It was a shame more people didn't make the ride but it turned out we were all virgins when it came to riding abroad. Dave had ridden all the way from London and he expected to crack the double century by the time he got home. Simon had ridden from his parents house down the road in Kent. After a bit of chat we headed to the gate to board and it wasn't long before we were on the boat. You can ride up the ramp but where the boat meets the road, you have to get off and walk. Once on the boat, we found some bike racks and locked our bikes up. Mileage so far, 20.4. We went in search of breakfast and both Simon and I opted for the cooked variety and Dave preferred the liquid option in the form of double espresso. Although the food was nothing special, it hit the spot. 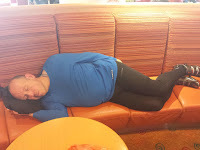 With Dave having ridden 70 miles overnight, he was looking forward to the option of a kip during the 90 minute ferry crossing. With requests of no pictures to be taken whilst sleeping, both Simon and I couldn't help ourselves, especially as Dave fell asleep so quickly. 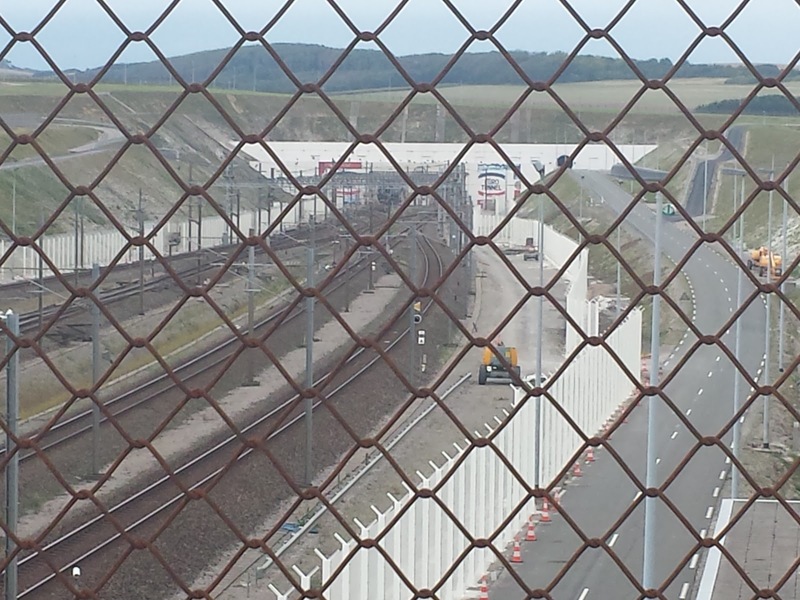 Upon arrival in Calais, Dave woke on cue and we readied ourselves to go back down to our bikes on the lorry deck. It wasn't long before we got off the boat and were on our way. Both Simon and I had the route on our Garmins so we knew where we were headed. 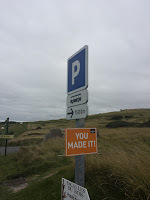 We were hoping that we wouldn't need to rely on technology, hoping that the organisers of the Wiggle ride happening the day after would have put the direction signs up already. It wasn't long before we saw a migrant camp by the side of the road but nowhere near as many as I'd seen in the news. As we exited Calais and arrived in Sangatte, I caught the smell of fresh bread at a boulangerie. Very tempted to stop but it was too early in the ride. Just down the road we saw the first Wiggle direction arrow. This would make the ride simpler. As we were headed south-westerly, the head wind was quite noticeable. It's quite flat as you leave Calais so there is no shelter from the wind. For many miles we rode in formation and Simon, who had informed us of his lack of riding recently, was doing a stellar job of leading us out. 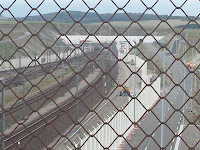 About 10 miles in we came across the Eurotunnel exit and spotted a British couple on a tandem that had stopped to take pictures. We did the same and jumped out of our skins as the emerging train sounded its horn. We got to a junction and the Wiggle sign said one way and our route said the other. We decided to follow our route for continuity. This is where the terrain started to get lumpy. Nothing serious but there was shelter now as we started riding through villages. We were on a busy road for a little bit and I was thinking to myself, "I wonder if that's why the Wiggle sign said to go a different direction". However it wasn't long before we turned off and were on to little country roads. A little climbing and we arrived at our first village. There were a number of new houses, each detached and unique. This would be a recurring theme throughout the ride. Each village we passed through was small and we were out the other side in no time. Most were very quiet and people were scarce. As you exit a village, there's the place name on a sign with a line through it to show you are now leaving it. With the forecast set for rain at some point I was expecting to get a soaking. The clouds were getting darker but as we turned to head north, they seemed to be where we had just come from. Simon then mentioned that he thought we'd ridden around the rain. Shortly after it started to drizzle! However, the drizzle only lasted about 10 minutes and that was all we had all day. 34 miles in we arrived in the town of Wierre-Effroy. This was our planned lunch stop. We arrived a few minutes before 13:00 and the cafe was shut. It closes at 13:00 on Saturday. I quickly spotted a bakery across the road. We scooted over and I spotted a theme. It closed at 13:00! We decided to have a short break and think through our options. We all had some snacks on us so we weren't desperately worried. A few yards up the road and we noticed another hostelry. The door was open, so with Dave being the most fluent in French (read: not very), he approached the proprietor and after a few words exchanged, he came back out empty handed. Never mind, we would get back on our bikes. We must remember, this was our French adventure. 4 miles down the road we spotted a service station on the A16. Not being on the main road, we weren't sure if we could get in, but we thought we'd take a look. There was a way in for pedestrians so we were in luck. We locked our bikes up and took a wander inside. There was no cafe, like you get ta a lot of continental services, but they sold plenty of food and had a coffee machine. Having felt less than strong up until this point and allowing the other two to lead, I was feeling much better now. 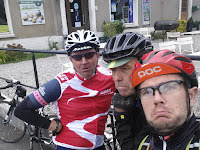 It may have been the lunch stop, or it may have been that we now had a tail wind. The legs seemed to push without much asking. The bonus of riding up hills, is that you can enjoy going down the other side. Dave is a competitive rider and on a few descents, he decided to outdo me. On one such elevation drop, I went for it, as did Dave. I spotted a Wiggle sign at the edge of the road and looked down at my Garmin to confirm. There was a left turn. I shouted at Dave and slammed on the anchors. Dave was clearly in the 'zone'. He shot off down the hill at 40+ mph and I waited for Simon to catch up. We both tried ringing him but to no avail. It was now just a waiting game to see how long he'd take to notice we weren't behind him. About 10 minutes later we saw him emerge into view. We got our phones out to record the look on his face. With the added power in my legs I took the opportunity to shoot up the next hill. Dave and Simon both resisted to chase and due to my lack of local knowledge, the short sharp climb I was expected carried on for a good quarter of a mile further round the bend! When I got to the top, there was a nice view of Calais in the distance. It was at this point we noticed a cafe that was open. It seems they open again later in the afternoon. As we approached the cliffs of la Manche (English Channel) I could see we had some more hills to climb. They are long and steep in places and with a tail wind, you get quite warm riding up them. I got to the top of the final climb first but most likely because Dave was saving energy for his long ride home. At the top was a Wiggle sign with 'You made it!' on it. There was now a lovely long descent into Sangatte. I didn't pedal the whole way and enjoyed the speed gravity propelled me to. It goes on for about two miles. 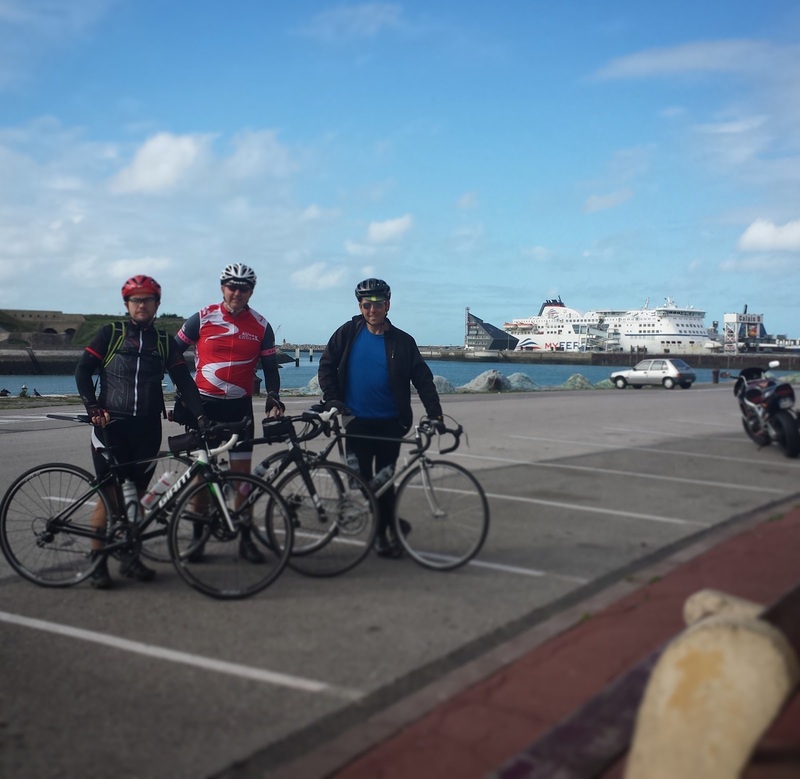 It was then a flat easy ride back into Calais. When we arrived in Calais, we decided to stop for coffee as we had time before the boat. We found a bar and sat down for a bit. We then found a spot to take a group photo with a ferry in the background. It was then time to take a slow ride back to the port. The French treat you the same as a car so you have to queue with all vehicles which is a little tedious. I don't mind having to wait, but when you are on your feet for so long in the queue it seems a little unfair, Imagine if it was heavy rain. Mileage so far 84. We finally made it to the boat and although delayed, we were finally on our way back home. Dave had another kip on board and after missing our slot to unload in Dover, we were made to wait before docking. We got our bikes from the car deck and made it to the front, just to be told that we had to wait for all the other vehicles to offload first. I powered up my Garmin and it would only show 'Working' on the screen. After a few minutes it turned itself off. I tried a few times more but the same kept happening. I decided to start Strava on my phone as a back up for the final leg. About 20 minutes later we finally made it off the boat. By this time the sun had dipped below the cliffs. It was noticeably colder as a result. We parted ways and I headed back to my car in Dymchurch. It's a long old drag to Folkestone but I made good progress. There's a fast downhill into the town and then it's flat the rest of the way. It was a little boring to be honest. I made it back to my car by 8.45pm. I then got changed and loaded the bike inside. I now had a about an hour drive home. Total mileage 105. When I tried to upload my ride onto the computer, the same issue happened. My Garmin was 'Working'. I eventually got it to power up but the ride was lost. All I had was the last 20 miles. Disappointed and even tempted to go back to France for a another go. I'd recommend anyone giving a French adventure a go. It's cheap and easy to do and makes a change to ride somewhere new.